I really enjoyed painting this one and love how it turned out. 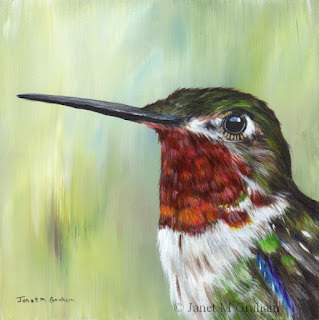 Broad Tailed Hummingbird measures 6 x 6 inches and is painted on Ampersand Gessobord Panel. 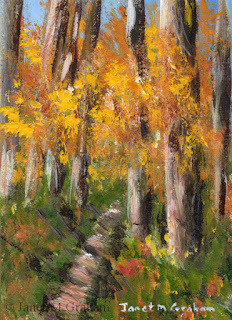 Many thanks to Evelyn Harrison for the reference photo. Love how this one turned out - everything just seemed to work. 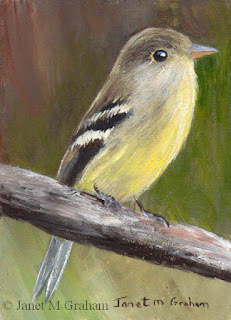 Philadelphia Vireos are a small song bird found in North America. They measure around 11 - 13 cm in length and weigh between 11 - 13 grams. Philadelphia Vireo measures 2.5 x 3.5 inches and is painted on 300gsm smooth Arches watercolour paper. Love the position this one is perched on the branch. Used a few glazes to get the depth the feathers. 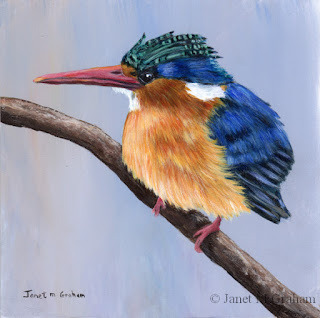 Ringed Kingfisher measures 3.5 x 2.5 inches and is painted on 300gsm smooth Arches watercolour paper. 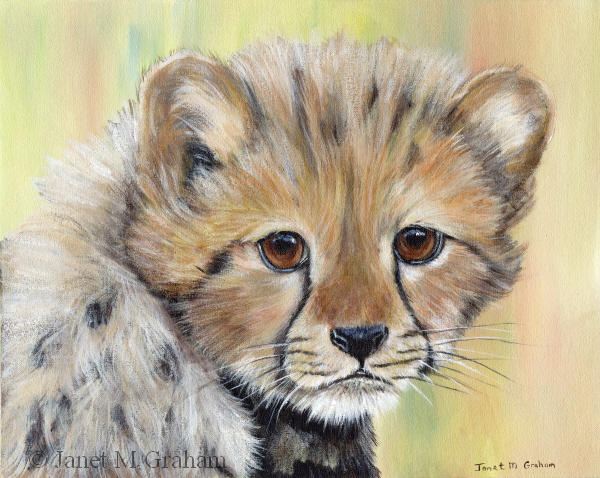 I couldn't resist painting this cute cub. Really pleased with the final painting. Cheetah Cub measures 10 x 8 inches and is painted Fredrix loose unstretched canvas. 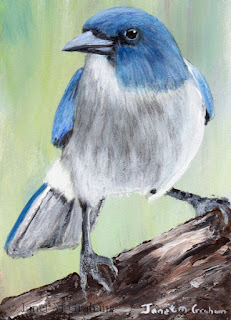 Many thanks to Shirley Kroos for the reference photo. This one was really fun to paint. Really pleased with how it turned out. I used a few glazes to get the depth to the feathers. Robin No 8 measures 6 x 6 inches and is painted on Ampersand Gessobord Panel. 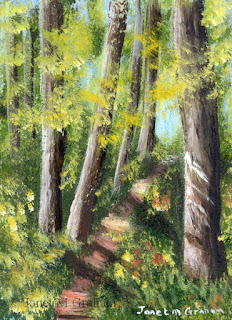 Many thanks to Ray Wheeler for the reference photo. Prothonotary Warbler measures 2.5 x 3.5 inches and is painted on 300gsm smooth Arches watercolour paper. 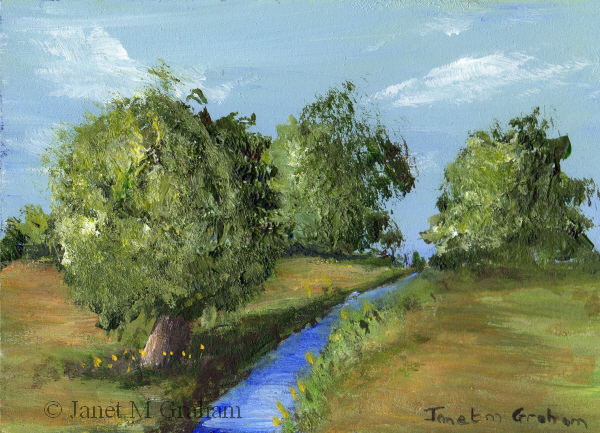 I decided to paint this one in a more looser style and really pleased with how it turned out. Cardinal ACEO measures 2.5 x 3.5 inches and is painted on 300gsm smooth Arches watercolour paper. Many thanks David Rowe for the reference photo. I decided to paint a flower for a change. 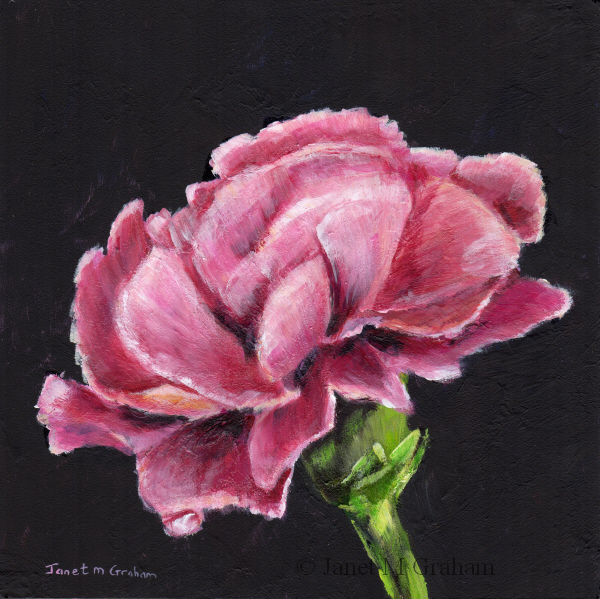 Pink Carnation measures 6 x 6 inches and is painted on Ampersand Gessobord Panel. Love the position this one is perched on the branch. 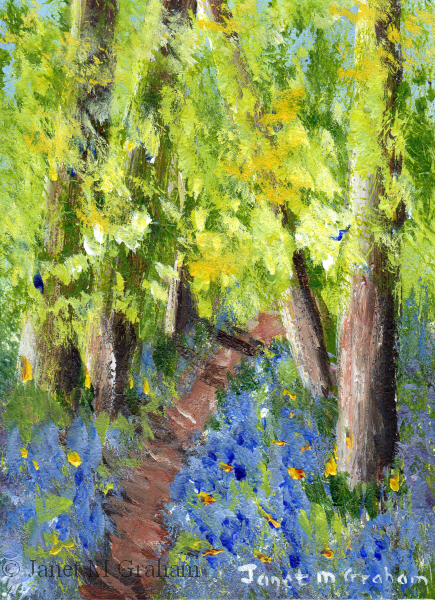 Really pleased with how the final painting turned out - everything just seemed to work. 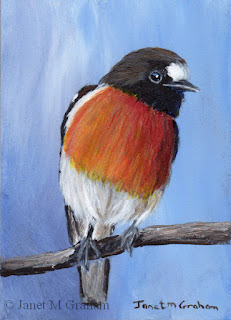 Scarlet Robin measures 2.5 x 3.5 inches and is painted on 300gsm smooth Arches watercolour paper. I love the feather colours of this one - from its bluish -green head to the varies colours on its wings and belly. Green Headed Tanagers are found in Brazil, Paraguay and Argentina. They are around 13 cm in length and weigh about 18 grams. 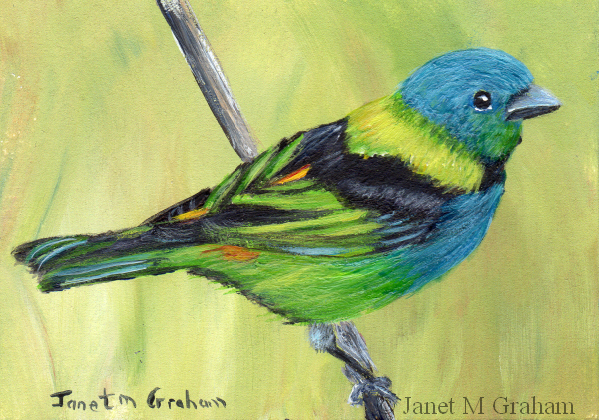 Green Headed Tanager measures 3.5 x 2.5 inches and is painted on 300gsm smooth Arches watercolour paper. This one ended up looking nothing like the reference photo but really pleased with how it turned out. Tranquil River measures 2.5 x 3.5 inches and is painted on 300gsm smooth Arches watercolour paper. This one was really fun to paint. 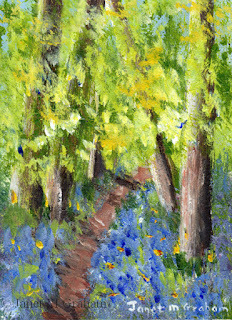 Summer Fields measures 3.5 x 2.5 inches and is painted on 300gsm smooth Arches watercolour paper. Love the colouring of the macaws. I took the reference photo for this one a couple of years back. I have had it printed out to paint for ages but I keep adding to my pile of reference photos so it can take me a while to get around to painting them. 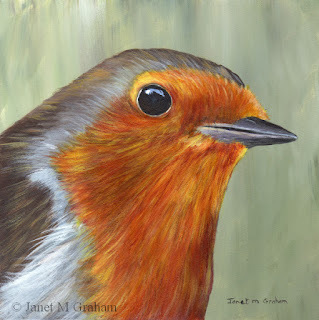 I really enjoy painting the close up portraits of the birds so I am planning on painting a few more. 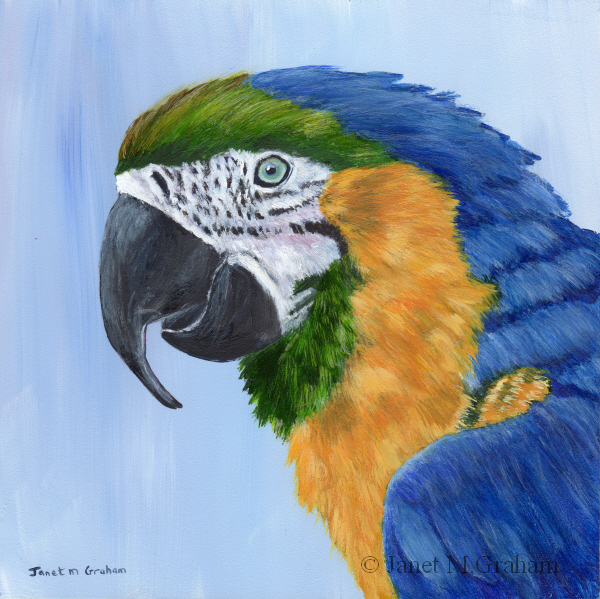 Macaw measures 6 x 6 inches and is painted on Ampersand Gessobord Panel. I love how this one is all fluffed up. Really pleased how it turned out. Malachite Kingfisher measures 6 x 6 inches and is painted on Ampersand Gessobord panel. 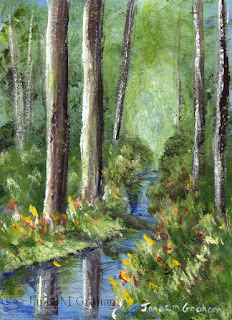 I felt like painting a few landscape aceo's. 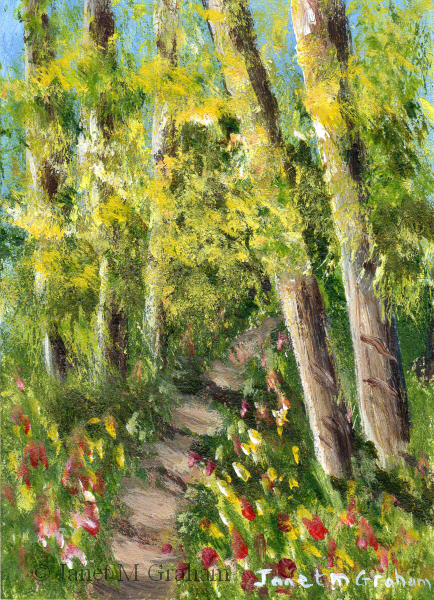 They were rather fun to paint - kept the path more or less the same in each one and just changed the seasons and position of the trees. Love the colouring of this one head feathers. Really pleased with how it turned out. 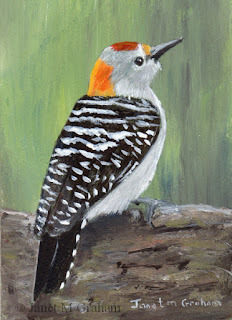 Golden Fronted Woodpecker is found in Mexico, Central American, Texas and Oklahoma. They measure around 22 - 26 cm in length and weigh between 65 - 102 grams. Golden Fronted Woodpecker measures 2.5 x 3.5 inches and is painted on 300gsm smooth Arches watercolour paper. 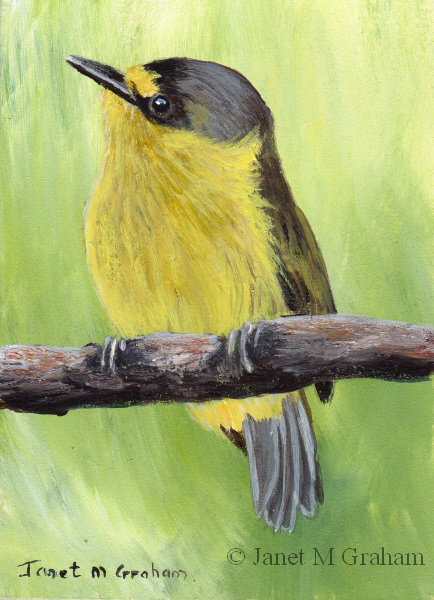 Yellow Bellied Flycatchers can be found across Canada and North Eastern United States migrating to southern Mexico and Central America. They measure around 13 - 15 cm in length and weigh between 9 - 16 grams. 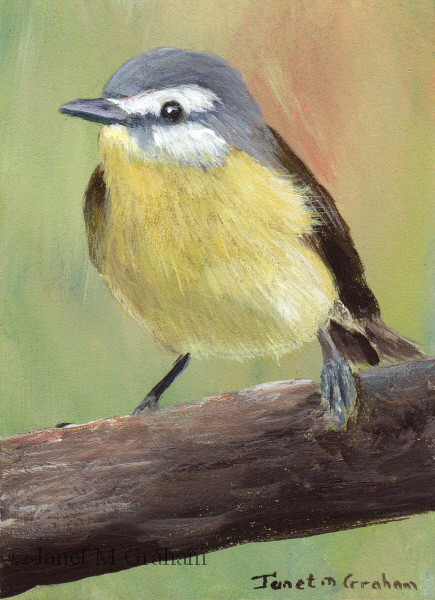 Yellow Bellied Flycatcher measures 2.5 x 3.5 inches and is painted on 300gsm smooth Arches watercolour paper. I love the brilliant red head of this woodpecker. Red Headed Woodpecker is found in North America. They range in length for 19 - 25 cm and weigh between 56 - 97 grams. 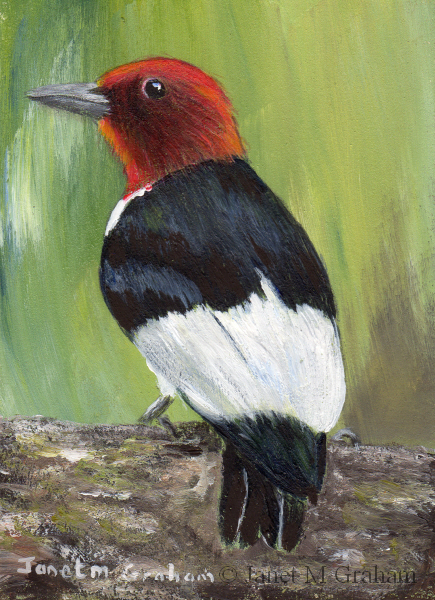 Red Headed Woodpecker measures 2.5 x 3.5 inches and is painted on 300gsm smooth Arches watercolour paper. I really enjoyed painting these two. 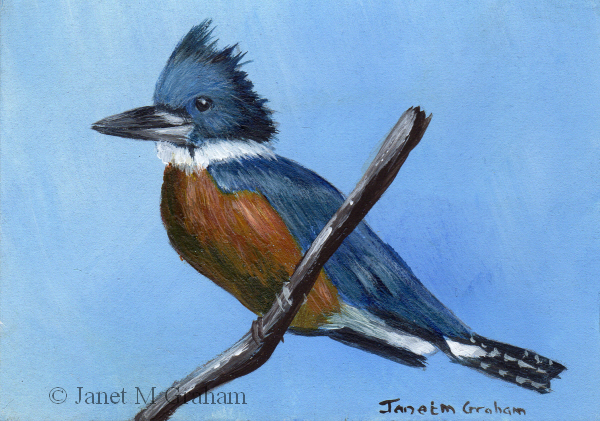 I used quite a few glazes to get depth and colour to the feathers. 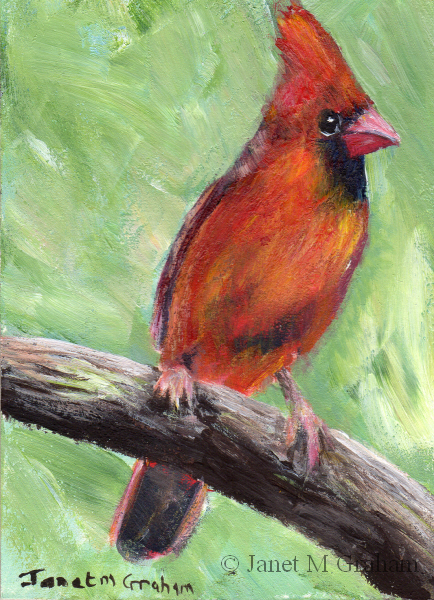 For the male cardinal, I used a red glaze over yellow/white for the highlighted areas which work really well. 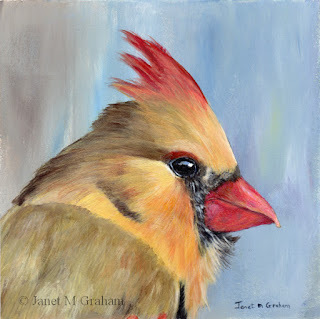 Northern Cardinal (Female) measures 6 x 6 inches and is painted on 300gsm smooth Arches watercolour paper. 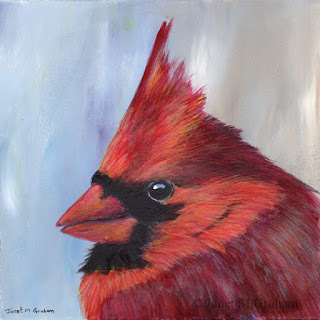 Northern Cardinal (Male) measures 6 x 6 inches and is painted on 300gsm smooth Arches watercolour paper. Many thanks to Rodney Campbell for the reference photos. 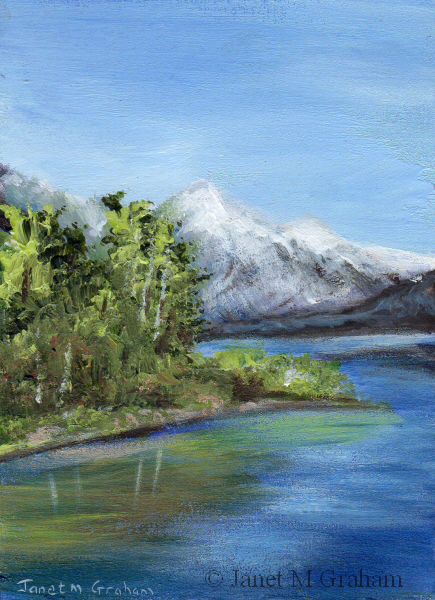 Decided to paint a little landscape scene for a change. It seemed appropriate to paint a snow scene as we have a cold front on the way and there is a possibility of snow showers on the Darling Downs / Granite belt (which is about 132 km inland from Brisbane) over the weekend. Think I will be pulling out my gloves and beanie for the weekend. 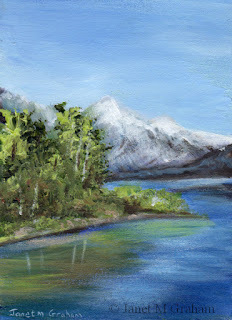 Snow Capped Mountain measures 2.5 x 3.5 inches and is painted on 300gsm smooth Arches watercolour paper. Really pleased with the depth I managed to create with the green plumage - I used a glaze of transparent yellow for the highlights which seemed to work rather well. 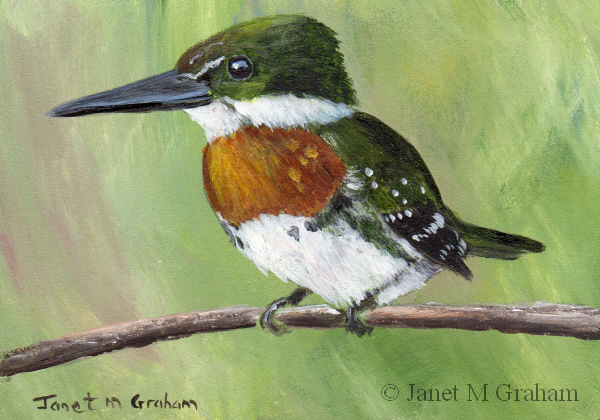 Green Kingfishers occur from southern Texas in the USA, south through to Central and South America though to central Argentina. They measure around 19 cm in length and weigh around 27 grams. Green Kingfisher measures 3.5 x 2.5 inches and is painted on 300gsm smooth Arches watercolour paper. 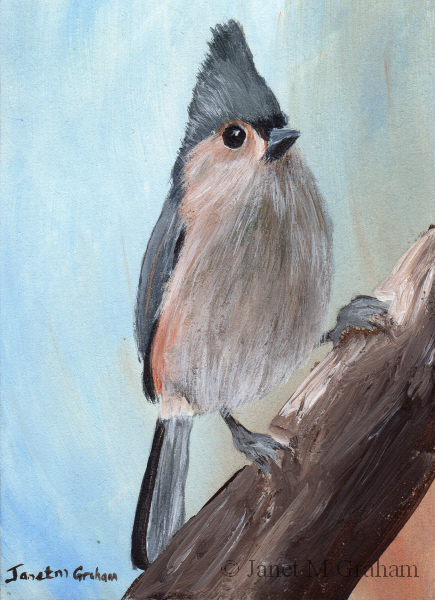 For my next one, I painted this little fellow. Yellow Lored Tody Flycatchers are found in Brazil. They measure around 8.8 cm in length and weight around 6.8 grams. 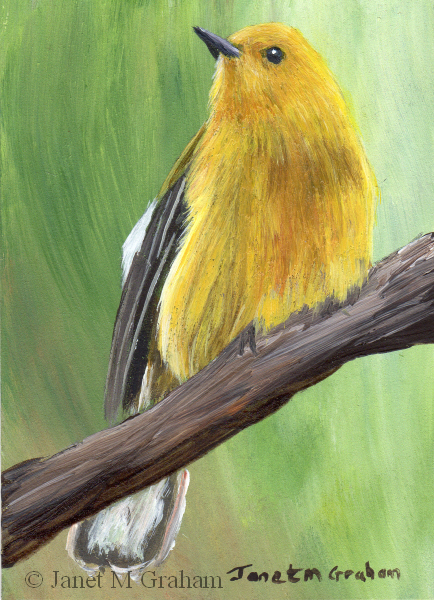 Yellow Lored Tody Flycatcher measures 2.5 x 3.5 inches and is painted on 300gsm smooth Arches watercolour paper. I cropped right in on this reference photo. It was a bit tricky painting so much green foliage but I am rather pleased with how it turned out. 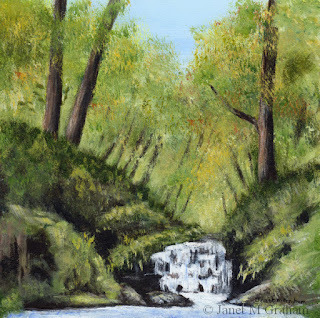 Waterfall measures 6 x 6 inches and is painted on Ampersand Gessobord Panel. 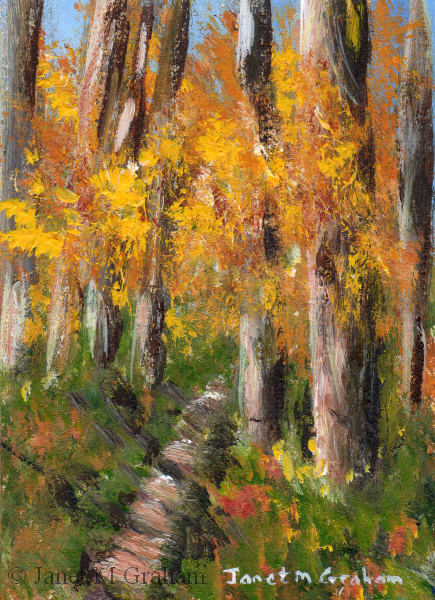 The only part of the reference photo I used for this one was the reference for the birch trees. I changed everything else. Really pleased with how the final painting. 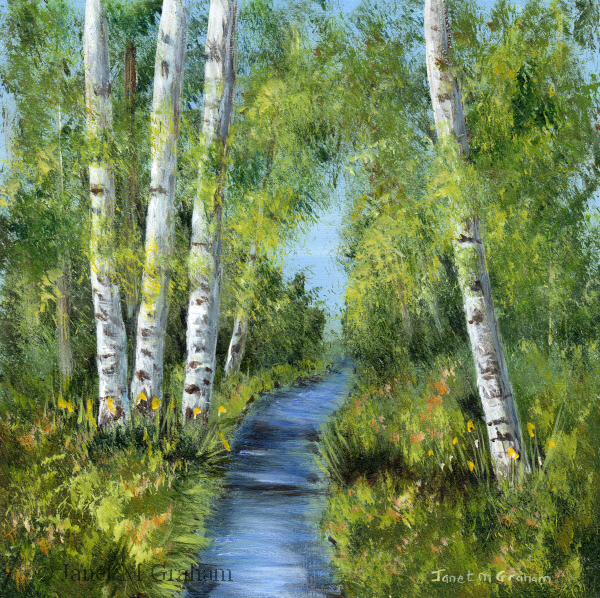 Summer Birches measures 6 x 6 inches and is painted on Ampersand Gessobord Panel. Mexican Jay measures 2.5 x 3.5 inches and is painted on 300gsm smooth Arches watercolour paper. This one was rather interesting to paint re black feathers. Rather pleased with how it turned out. 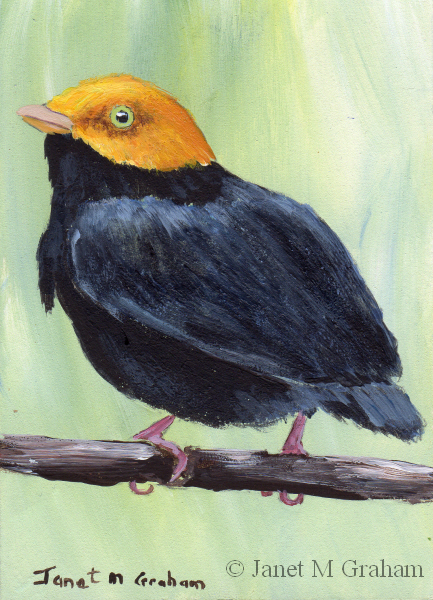 Golden Headed Manakin's are found in South America. They measure around 9.4 cm in length and weigh around 12.5 grams. Golden Headed Manakin measures 2.5 x 3.5 inches and is painted on 300gsm smooth Arches watercolour paper. Love the colouring for this one. Rufous Hummingbirds are found North America. They measure around 8 cm in length and weigh between 2 -5 grams. 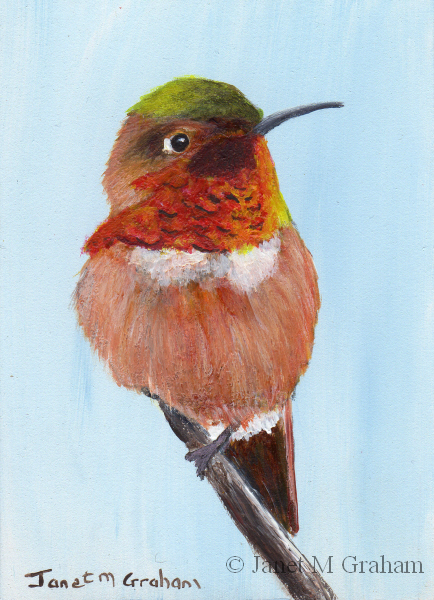 Rufous Hummingbird measures 2.5 x 3.5 inches and is painted on 300gsm smooth Arches watercolour paper.